WASHINGTON, D.C. — The Navy is starting tests next week for a fix to a critical safety issue found on the F-35C Lighting II Joint Strike Fighter, the head of F-35 Joint Program Office told reporters on Thursday. During testing in 2016 on USS George Washington (CVN-73), F-35C pilots complained when the aircraft was catapulted from the carrier, the aircraft excessively bobbed up and down on its nose gear on its trip down the carrier’s deck making it impossible to read instruments, difficult to reach emergency controls and causing a certain amount of pain in pilots. “Fleet pilots reported that the oscillations were so severe that they could not read flight critical data, an unacceptable and unsafe situation during a critical phase of flight. Most of the pilots locked their harness during the catapult shot which made emergency switches hard to reach, again creating, in their opinion, an unacceptable and unsafe situation,” read a December from the Pentagon’s director, Operational Test & Evaluation report. In an evaluation of the pilot discomfort following 105 test launches on George Washington (CVN-73), 74 resulted in moderate pain, 18 caused severe pain, reported Inside the Navy. 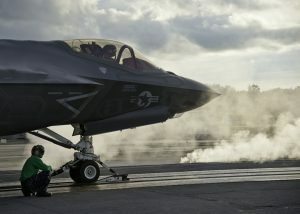 On Thursday, F-35 JPO head Air Force Lt. Gen. Christopher Bogdan told reporters testing to fix the problem would begin at Joint Base McGuire-Dix-Lakehurst, N.J. at the Navy’s land-based test catapults. “The first fix that we’re looking at… is when you first hook up the airplane to the catapult there’s a pullback mechanism and we pullback really hard and that compresses the strut a lot and when you launch you get the oscillations,” Bogdan said. A Navy official told USNI News the testing was set to start on Feb. 21. Rear Adm. Mat Winter, deputy program executive officer for the F-35 said if the pullback fix worked, it would be easily translated to the ship. “The important point is the Lakehurst testing is 100 percent representative, so we’ll know the technical fix and take it to the ship,” he said. The up and down oscillations issue is similar to one pilots suffered in early testing of the F/A-18 Hornet that was fixed, a Navy official told USNI News on Thursday. The service was able to adjust the pullback force during launch of the aircraft that corrected the issue with the Hornets. However, if the early attempts at a fix don’t work, it may require the Navy more extensive fixes to the nose gear and the helmet display, according to the December paper. The last ditch effort would be to redesign the entire nose gear for the F-35C which could take years and further delay the program. “A redesign could incorporate all the benefits of the advanced modeling efforts, but is expected to require a multiyear effort to re-qualify a major redesign,” according to the December paper.